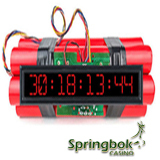 The Bonus Bomb is exploding at South Africa’s Springbok Casino. Just deposit between August 1st and August 11th and you'll receive an email with a special free bonus offer. In addition to the free bonus announced by email and through the casino message center, you can also claim a 150% deposit bonus Springbok will add up to 3000 Rands to all deposits until August 11th. Deposit between August 1 and August 11 to qualify for free bonus. South Africa’s most popular online casino offers hundreds of online slots and table games from Realtime Gaming (RTG), all played in Rands. In the newest game, Samba Sunset, scatters trigger free spins with added wilds and multipliers. It’s an “All Ways Pay” game so there are 243 possible winning combinations on each spin. Springbok’s most popular casino games are available in the mobile casino for smartphones and tablets. Customer service is provided in English or Afrikaans.